Below is a newsletter about the GlenDronach & BenRiach whisky brands. These brands have releases a couple of batches over the last few weeks and more about these releases can be read below. There is also a fantastic part of the newsletter which shows the travels Stewart Buchanan, the brand ambassador for the brands traveling the world. He explains in the newsletter how his life changed overnight when he was offered this job and it was a job offer that he could not turn down. Enjoy reading this press release as it gives you a good insight into both GlenDronach and BenRiach whisky brands. Over the past few weeks we have released our latest batches of single cask bottlings - GlenDronach batch 6 and BenRiach batch 9. Both batches again include some fantastic expressions. Meanwhile, Stewart, our brand ambassador, has been travelling around the world for tastings and other events and he will share some of his highlights with us. We released our 6th batch of GlenDronach single cask bottlings a few weeks ago. These five superb new releases have been selected by our Master Distiller Billy Walker, and all share GlenDronach's typically luxurious, richly-sherried characteristics, plus a fantasia of dates, orchestras of spices and explosions of honey, Demerara sugar, sweet molasses, mocha and even fruit cake! An excellent example is Cask 1247 that has been matured for an amazingly 41 years in a Pedro Ximenez Sherry Puncheon. In appearance it is rich mahogany with deep hints of cherry wood. On the nose, Demerara sugar, Pedro Ximenez sherry notes, dark chocolate and figs. On the palate, luxuriant chocolate-coated raisins, and a wave of spices followed by an explosion of sweet molasses, Demerara and mocha. 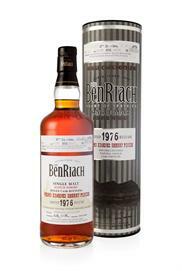 BenRiach Batch 9 includes 10 amazing expressions ranging from 22 to 35 years. The release demonstrates the range of multi-layered expressions for which BenRiach is renowned. As would be expected from BenRiach, there is tremendous variety across the 10 casks, including ‘classic Speyside’, peated expressions and various wood finishes. Billy’s tasting notes convey a seductive mélange of styles ranging from “waves of damsons, plums and raisins” to “sweet honey with vanilla”, “buttered toast” and “a beautiful combination of peat reek, dates and dark chocolate”. By Stewart Buchanan, newly installed BenRiach and GlenDronach Brand Ambassador. So the journey begins...Although I have covered many shows, tastings and events over the years, they were always a wee sideline from production and seen as a bit of a “jolly”. I did wonder how I would get on with this being my full time job? I didn’t hesitate accepting the position when Billy and Alistair Walker offered it to me but I will admit I didn’t exactly know what I was letting myself in for: a life away from production after 20 years, moving to Glasgow, 9 till 5 in an office environment, constantly travelling around the UK, Europe, the world. It was going to be a 100% change of lifestyle. With my house in Elgin all packed into an old garage at BenRiach, I jumped into the car with a holdall of clothes in the boot and my kilt thrown into the back seat. I waved and tooted farewell to the warehouse boys and neighbours, and with an Arnold Schwarzenegger style “I’ll be back!” I turned left out of BenRiach and sped down the Longmorn strait. Should I have been worried? Not at all! From the word 'go', I was on the road and the funny thing is that it felt perfectly natural. Travelling to such diverse places no matter how big or small, near or far, each and everyone has been fantastic. The whiskies I have been able to offer have also been outstanding - from some old GlenDronach 70’s vintages to the fantastic new BenRiach Septendecim which is now at the heart of our BenRiach peated range. Also bringing the GlenDronach 21YO Parliament and the new BenRiach Authenticus 25YO to people for the first time has been amazing. I love the feedback when we can offer such a rich mixture of expressions in one tasting. Sometimes the only problem is that time goes so fast when you’re having such fun! I wish I had space to detail all the trips and to thank everyone I have visited so far but it would run to endless pages so I would just like to say a big thank you to anyone reading this that I have bumped into over the last few months and I hope you have enjoyed the tastings as much as I have. I was lucky enough to be staying in a hotel in Tronsberg, Norway, which was next to the construction of a replica Viking ship ‘Saga Oseberg’. It was amazing to see the ship being crafted using the traditional methods. After a tour of the build site, I was invited to join the boat builders for a campfire, barbeque and a few warmers of aquavit - a great night and company. The most bizarre moment was undoubtedly crashing the (totally off limits) fish market in Tokyo. With two of the usual suspects from the industry, we hitched a lift on what I can only call a cement mixer powered barrow, whizzing through the narrow lanes of fish tanks and boxes. We struggled to hold on with laughter and after jumping off the buggy we passed every species of sea life imaginable. We stopped at a lovely old man standing beside the biggest fish I had ever seen (roughly the size of a small horse). The slice in its back showed the scarlet flesh, gesturing to the wee man I pinched a bit of the melt in the mouth tuna which had only been caught 3 hours prior. Six men heaved the beast to the wooden slab to prepare it for its last journey to restaurants and shops across the country, if not the world. We did attract a few odd looks as we inspected the days catches and it wasn’t long until we were kindly asked to leave. As we walked back to the hotel we asked ourselves if what we had experienced actually happened. The BenRiach Distillery Co. Ltd.